The stock market has been on a consistent bull run since it hit a low in March 2009. As stocks keep hitting new highs for the year however, buyout by the prospect of economic recovery, many value investors are getting nervous about valuations. The P/E ratio on the S&P 500 for example has risen to its highest levels in several years. In addition to that, many dividend stocks, which were once selling at very attractive valuations just a few months ago, are becoming expensive. There are several ways that the market could correct itself. First, since the market is typically a strong indicator that predicts contractions and expansions in the economic cycle much better than most economists, the current upturn could be a forecaster of economic growth. This would lift earnings, decrease unemployment and bring valuations down to more reasonable levels, without causing any depression in stock market prices overall. If the market is ahead of itself however, it could stay flat for a period of time. The second option is for the market to collapse and bring valuations to more reasonable levels. It seems that most investors and pundits believe that a severe decline in stock prices is in the cards over the next few months. Since few people seem to believe in the market rally however I strongly believe that it could easily continue. The third option could be that the market doesn’t correct itself but keeps roaring higher, propelled by expectations of strong corporate earnings. When earnings rebound, stocks won’t look as expensive as they do today. As a dividend investor I try to allocate some funds into purchasing several stocks every month. The main problem I have been having since July is that the same stocks are appearing on my buy screen for several months now. While it is always good to be able to purchase what you might consider the best dividend stocks in the world, history has definitely showed us that even the bluest of blue chips might not be bulletproof in the long run. It is concerning to add money to the same stocks each and every month, which could make a portfolio more concentrated and less diversified. 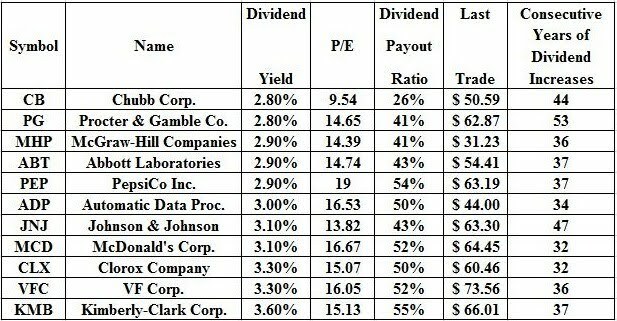 Valuations are an important factor, which every dividend investor should implement as part of their entry criteria, in order to make sure that they don’t overpay for stocks. Overpaying for stocks could lead to substandard returns over time. As a matter of fact, stocks could continue climbing the wall of worry far longer than anyone could stay sane. Disciplined dividend investors should stick to their strategies in the meantime and refuse to concentrate their portfolios or overpay for stocks. While keeping a portion of your portfolio in cash or fixed income might seem ludicrous given the low interest rates, it could provide some cushion to ones portfolio should the right stocks fall below the right entry prices. If stocks were to keep going higher in a straight line and if Dow and S&P 500 reach all time highs in the process, by pushing valuations higher and higher, investors would probably be kicking themselves for “missing the boat”. As individual investors however, we are not rewarded based off short term performance, unlike mutual fund managers who have to be invested at all times. Thus, individual investors have an advantage over the pros right now since they could decide for themselves whether paying top dollar for adding to existing stock positions is worth it or not. Back in 1990’s the stock market was in the midst of a strong bull run, which pushed valuations to stratospheric levels. Investors enjoyed double digit annual increases in stock prices and thus they didn’t care that rising prices pushed dividend yields to very low levels. Fast forward one decade and we are still where we were in the late 1990’s. 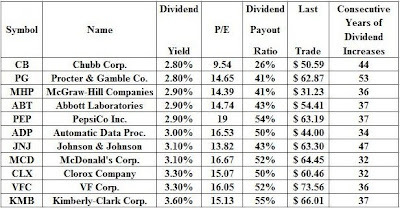 Even strong blue chip dividend growers such as McDonald’s (MCD), Automatic Data Processing (ADP) and Pepsi Co (PEP) were yielding less than 2% each, which made them largely unsuitable for a dividend growth portfolio at the time. In order to be successful, a dividend investor has to identify the right dividend growth stocks, establish positions at attractive valuations over time, reinvest dividends selectively and diversify across sectors, industries and continents. These sound strategies would ensure the long term survival of the individual investor even during the most adverse of conditions.